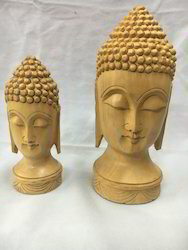 Prominent & Leading 100% Export Oriented Unit from Jaipur, we offer buddha head and wooden buddha head. Buddha demonstrated in his life that external good conditions are insufficient if we wish for lasting happiness. Rather, Buddha taught that to attain such happiness we must turn inside to create it within our own mind. He pointed out that for as long as our mind is un-peaceful we will not be happy and explained in detail which types of mind make us un-peaceful. He also taught which minds lead to peace and happiness. To achieve this dual purpose of removing harmful thoughts, or minds, and developing beneficial thoughts he taught the practice of Buddhist meditation to the people of his day. Using these methods many of his followers attained a lasting experience of inner peace and taught these methods to others. This is a process that has continued into this modern era where still people are practicing, gaining experience of, and teaching the methods that Buddha revealed. Owing to the years of experience we manufacture and supply a wide array of Wooden Buddha. This range is reckoned amongst the clients for its varied shapes, sizes and designs. Moreover, it is made using quality material which is directly sourced from the vendors thereby, ensures supreme luster and shine. Moreover, this range is available in the market at reasonable prices.